Costa Rica is a small, peaceful Central American country, known, unlike other Latin American countries, for its social and political stability. 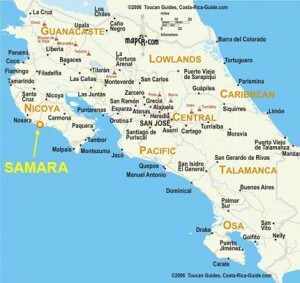 The country is bordered on the north by Nicaragua and to the south by Panama; to the east is the Caribbean Ocean and to the west, the Pacific. As it lies close to the Equator, Costa Rica enjoys a tropical environment. It has a multitude of wildlife species and its forests are dense and luxuriant. In fact, more than 5 percent of the worldÂ´s bio-diversity is found within Costa Rica, and more than one-third of the countryÂ´s land mass is now designated nature preserve. Volcanoes, rain forests, cloudy mountains, wild rocky coastland and tropical sandy beaches all are in complete balance with the wildlife and plant species that comprise Costa RicaÂ´s inestimable wealth.